This NEW DESIGN of stabilizing agility tunnels is simply the best solution available. We recommend at least one set for each end and depending on the size and weight of your dog and length of the tunnel, one or two sets in the middle. TUNNEL NOT INCLUDED. STRONG AND DURABLE - .38mm laminated PVC with commercial high quality stitching. Durable and resistant to UV damage and outdoor conditions, will not rot or mildew. 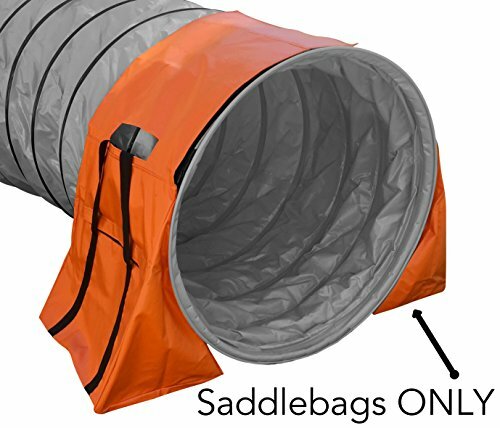 SADDLEBAGS ONLY, TUNNEL NOT INCLUDED, READ THE DESCRIPTION!!! This listing is for the SADDLEBAGS ONLY, the tunnel is not included. If you have any questions about this product by Rise8, contact us by completing and submitting the form below. If you are looking for a specif part number, please include it with your message.